Summer School 2015. Four weeks of half-days. 85 middle-schoolers from two middle schools. Too many students to retain (or keep back) in their current grade level for another year. 85 youngsters who have never been successful in school. Chronic behavior problems. Distrustful of adults. Disconnected from schooling. Angry. Defeated. Non-workers. If these failing students make it through these four weeks in June, they can pass to the next grade level with their peers. I am eager to apply the components of our successful, on-site alternative program, School Within a School, on a larger scale. I am eager to see if the components of implementation that we have honed for several years will work with kids we don't know, and with whom we will have little time to build relationships. Because of the various courses that must be available to three different grade levels of students, we are able to staff the program with nine teachers. I have a plan, so I insist on hiring my in-school suspension monitor who has provided effective behavior intervention in our middle school for more than 10 years. Staffing also includes an assistant administrator and a director. I am thankful that our district leaders realize the importance of sufficient staffing for a program designed for failing, struggling, chronic students. 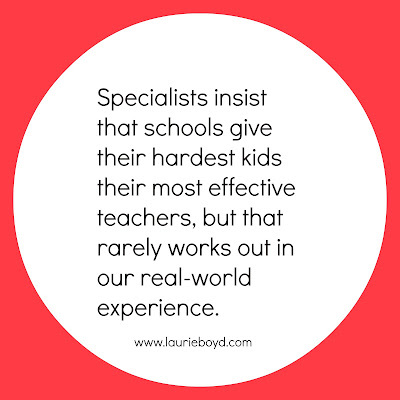 Specialists insist that schools give their hardest kids their most effective teachers, but that rarely works out in our real-world experience. We have a hard time filling our summer school teaching positions. 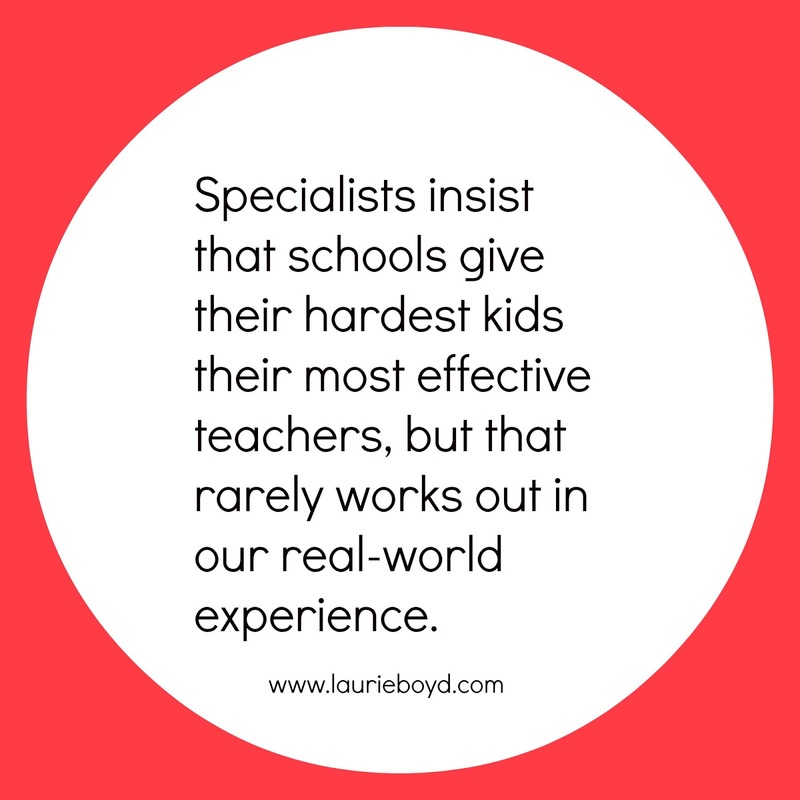 Hassling with the hardest kids for an extra month of school is not appealing to exhausted teachers. They already hassled with them all school year, and they could be starting their much-deserved summer break. Although I have four teachers from my own school, who are already skilled in our effective behavior model - Behavior Intervention Support Team (BIST), I also have three teachers from our partner school and two substitutes who do not know BIST. I will have to train them in some basic components of the model as we begin our program. First staff meeting. Schedules. Every teacher will deliver three sessions daily. 45 minutes each. Kids take three of four core classes: Math, Science, Social Studies, Language Arts. Class size: nine or fewer. Curriculum is simple: How to Succeed in School. A little reading, writing, and math each day so kids can practice their new skills, but emphasis is on motivation, student-teacher relationships, managing emotions, and follow through. 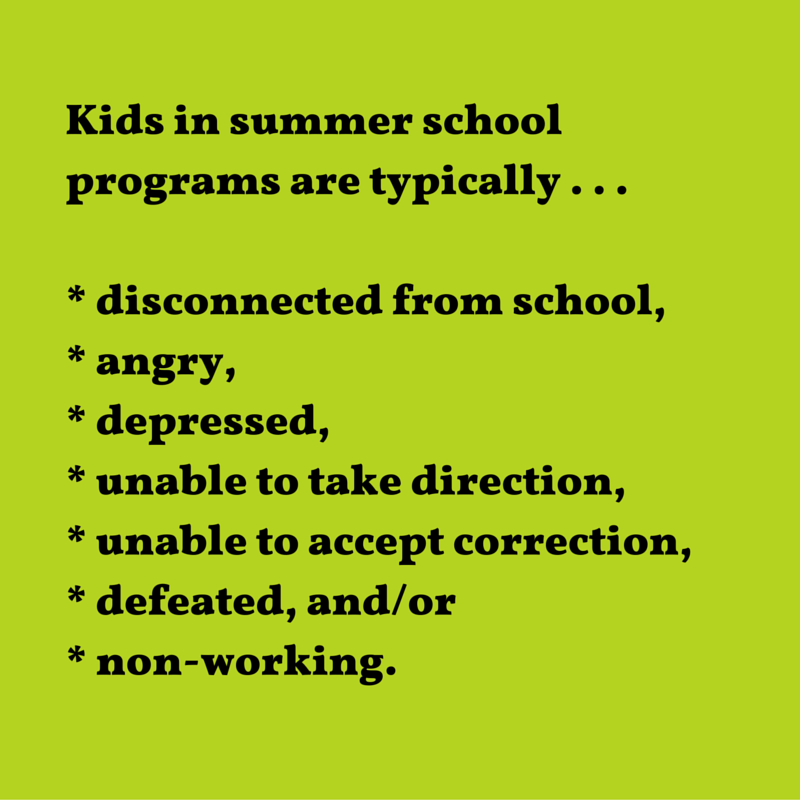 I summarize the student profile I expect in summer school: kids who are disconnected from school, who are disruptive and miss out due to suspensions or alternative settings, kids who cannot manage their emotions, who cannot allow adults to tell them what to do, kids who do not work or have never been successful with academics. 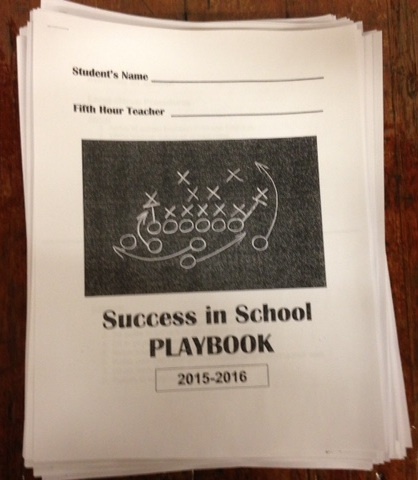 I give my teachers a copy of our hand-made Success in School Playbook. 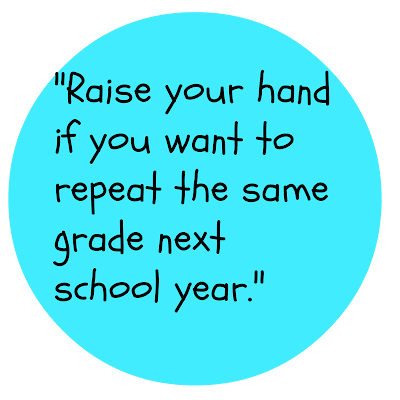 I review the first ten days of curriculum, which is four large-group procedures, three classroom procedures, five rules and (for summer school) our three-step consequences. I assure teachers that all they have to do for misbehavior or refusal to work is 1. make the request for the appropriate behavior, 2. ask the student to move to a safe seat in the room, 3. ask the student to go to Recovery. If a student does not have to move past the safe seat, and processes about the incident successfully with the teacher, he or she is allowed to go to Rec. Otherwise, he stays in, or returns to Recovery. Anyone who will not cooperate in Recovery will see the assistant administrator for an office consequences. Book pages designed to help kids learn these lists of rules and procedures and to think about themselves as scholars are included in the Success in School Playbook. The last page is a stamping chart. Kids will earn a stamp from their teacher for their behavior and participation in Morning Meeting, Hour 1, Hour 2, and Hour 3. Every day begins with breakfast in the cafeteria and Morning Meeting. Kids sit with their first-hour teacher in a small group. My opening speech for our first morning meeting: "Good morning. My name is Mrs. Boyd. I am the principal here at Arrowhead. Welcome to everyone, and especially to all of our students and teachers from Eisenhower. 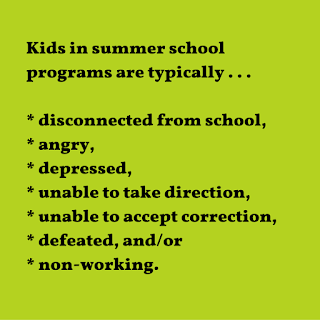 We have a really good program developed for your summer school experience. We like to keep it one hundred here at Arrowhead. We like to keep it real, so let's talk about why you are here." "There are only two reasons you would have to be enrolled in summer school. One, you missed a lot of learning due to disruptive behavior. Or, two, you refused to do your work. I can see that some of you want to say, 'I didn't refuse.' But you didn't work, so even if you never said it, you were refusing. It was your choice." "Okay. 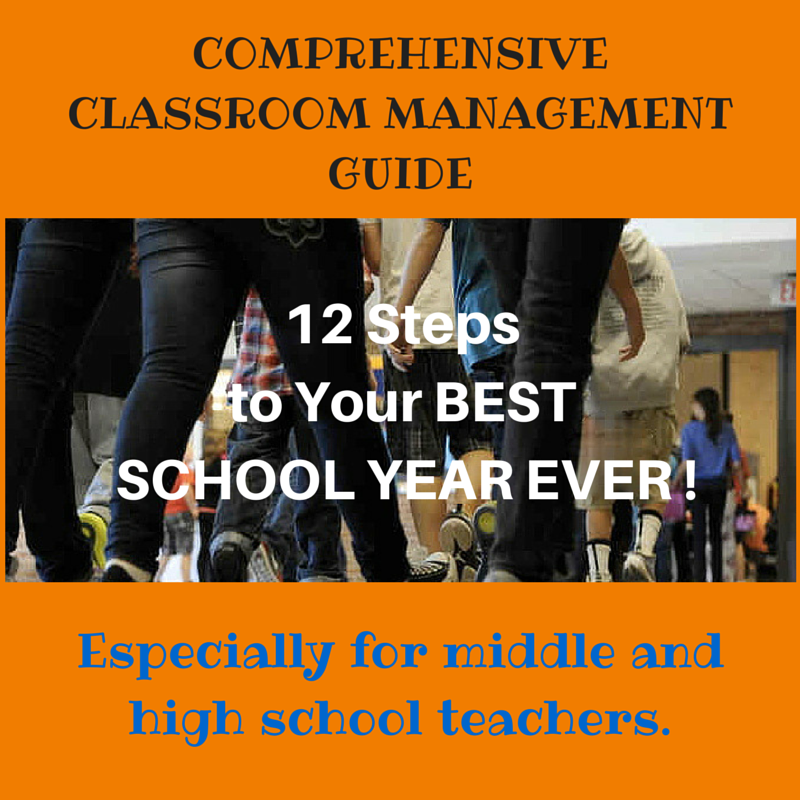 We're going to tell you exactly what you need to do to complete summer school and pass to the next grade with your peers." "We developed this summer program with you in mind. Every single day, we are going to have Rec. After your last class and right before lunch, we will all go, either to RECreation, where you will get to play basketball or dodgeball in the gym, or minecraft in the computer lab, or you will go to RECovery, where you will complete any incomplete work or write a think sheet about a behavior incident. One or the other - Recreation or Recovery." "All you have to do to earn Rec. is to do what your teacher tells you to do and to not go past step two of the discipline system in any class period. That means you may get a warning or a request about your behavior, and you may get a second redirect, which would put you in a safe seat in the classroom. If you fill out the Think Sheet honestly and process with that teacher before Rec. time, you may still go to Recreation. If you don't, you will go to Recovery instead, where Coach Mo will help you complete that same task." "If your behavior takes you to step three, you will go to Recovery immediately and for the remainder of that class period, where Coach Mo will problem-solve with you so you can get back into class and make it through summer school and progress to your next grade level." "During this Morning Meeting time, we are going to watch a motivational video by Eric Thomas, the hiphop preacher. Eric Thomas makes lots of money giving motivational speeches to professional athletes. We will share briefly what we heard E.T. say, and then we will begin classes. Don't forget that you must participate and behave appropriately to get your first stamp for Morning Meeting." We enjoy Eric Thomas's classic video, What's Your 'Why'? All of the students have already admitted to one "why" for succeeding in summer school: They want to pass to the next grade level. Teachers lead students to their first class, monitoring their performance of our hallway procedure. We make decisions about our program for the good of students, not for the convenience of the adults. We want everyone to be together during Morning Meeting so we can be a unit. Kids need a sense of belonging before they will cooperate freely. Teachers eat breakfast with their small groups. Coach Mo, our behavior teacher, leads the discussion time about the motivational video. At first, he has to slip a small candy to kids who will stand and share, but by the end of the second week, nearly everyone wants to participate. The adults make a point of interacting with one another in a happy, positive way. We laugh and joke with one another, then begin to add personal interaction with kids. One young girl, who obviously has to test every adult who has contact with her, has several screaming, cussing melt downs. Two female teachers and our Recovery Room teacher work to build relationship with her. She finishes the summer with a smile on her face, an attendance certificate, and an achievement certificate. Several sullen boys loosened up when my assistant administrator and our director formed three-on-three basketball tournaments for Rec. and hyped up the competition. We always have an adult team compete against or play with the kids. Dozens of boys quickly began to live for Rec. Their attitudes became cooperative and their sweet, boyish personalities showed through their masks as they relaxed among grown-ups who obviously enjoyed them and demonstrated that they were for them. Although two children received one or two days of suspension from the program for severe misbehavior, we did not have to terminate anyone's summer school. One parent opted to take her two kids on vacation instead of finishing the program, even though it meant the kids would have to repeat their grade level. Everyone else finished the program. We even had all the students take a Reading MAP test and a Math MAP test. They had to do their best and show at least one point growth from the last time they took it in order to attend the last day's field trip to a nearby park. Most of the students actually put forth effort on the test, many for the first time, and all but a handful showed significant growth. We know that the gains were due to their desire to see growth, not to any exceptional content learning during the few weeks of summer school, but we wanted them to see that they could do better if they decided to do better. On the day before our field trip, we held an awards assembly after breakfast in the cafeteria. 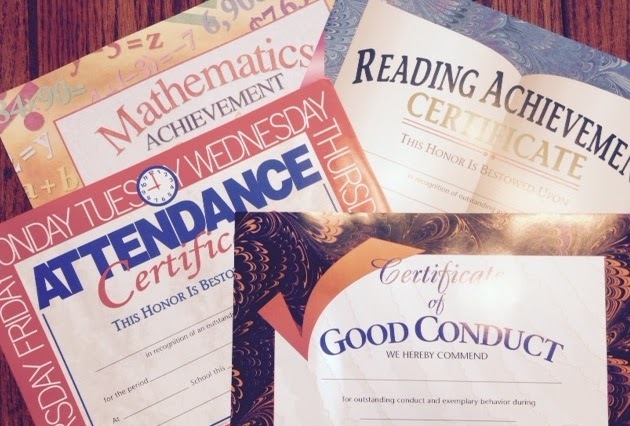 We prepared award certificates for attendance (no absences), for conduct (no Recovery), and for achievement (MAP test growth). We called each student's name, read off their awards, and issued their certificates. I added to each announcement, ". . . a-a-a-n-n-d-d, Joseph will be passing to the next grade level!" I knew that if I didn't see those certificates flying out the windows of the buses, or left behind on a desk, that they meant something to the kids. It appeared that every student valued their awards enough to take them home. These are kids who do not get behavior and achievement awards in school. It was a joy to stand out front of our school with my staff and wave to the happy young faces on the buses as they pulled off for the last time. 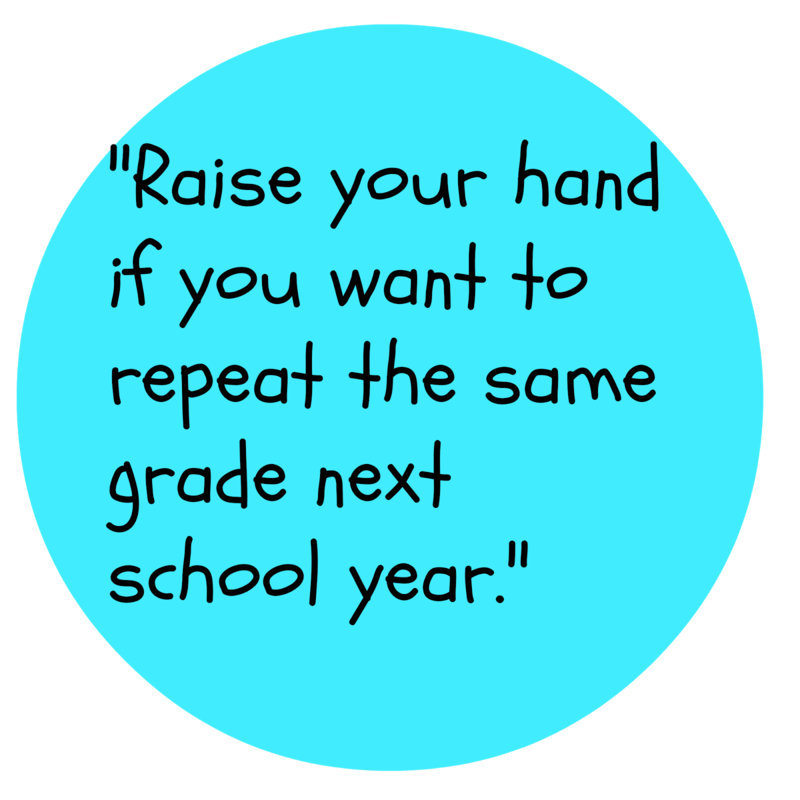 The teachers from our school who worked the summer program asked if we could all do a version of the program for our first two weeks of the regular school year. 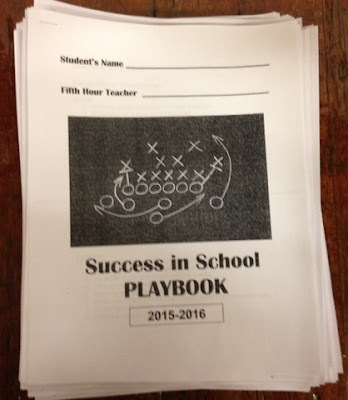 The Success in School Playbook (used to teach the building discipline system and enforce it with diligent consistency in every classroom). Daily motivational videos from Eric Thomas (most of them available on youtube) during hour 5/6. The teachers got a list of links to ten or twelve videos. Every classroom teacher played one 7- to 10-minute video each day. Kids wrote the following in their Playbooks: The title of the video, the main idea of the video, three memorable remarks presented in the video. After the exercises, a couple student volunteers shared their take-aways from that day's video. It's that simple! Daily Rec - Recreation or Recovery. The first day of Recreation is "free." Everyone gets to taste how fun it is. After that, Recreation has to be earned by doing what the teacher says and behaving in each class. In addition to supervising, adults play and interact with kids during Recreation. Kids in Recovery are held accountable for not working or being disrespectful or disruptive. From daily Rec., we move to weekly Rec. Students who need help to stay caught up in classes or who do not meet the standard for work completion may not earn Rec. often. The extra time to keep caught up is a gift and a support they have not had before. Students tend to appreciate the help, and most can accept missing play time since they are benefiting from the extra time with their teachers.